AP EXPLAINS: What is Iran's atomic deal? Why is it targeted? DUBAI, United Arab Emirates — Iran's nuclear deal with world powers faces its biggest diplomatic challenge yet as President Donald Trump is withdrawing the United States from the accord. At its heart, the 2015 deal imposes restrictions on Iran's nuclear program that make it impossible for Iran to produce a bomb, in return for the lifting of most of the U.S. and international sanctions against it. But the accord has a series of time limits. Under its terms, Iran only can maintain a stockpile of 300 kilograms (661 pounds) of low-enriched uranium, compared to the 100,000 kilograms (220,460 pounds) of higher-enriched uranium it once had. Iran can only enrich uranium to 3.67 percent, which can be used to fuel a reactor but is far below the 90 percent needed to produce a weapon. 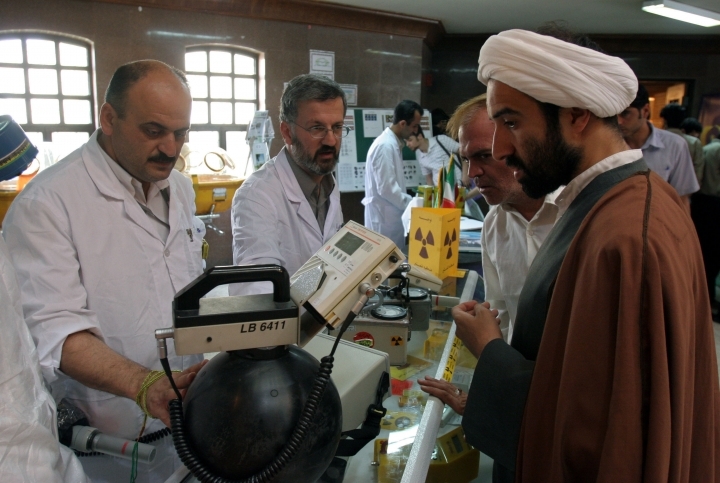 The deal also limited the number of centrifuges Iran can run and restricted it to an older, slower model. 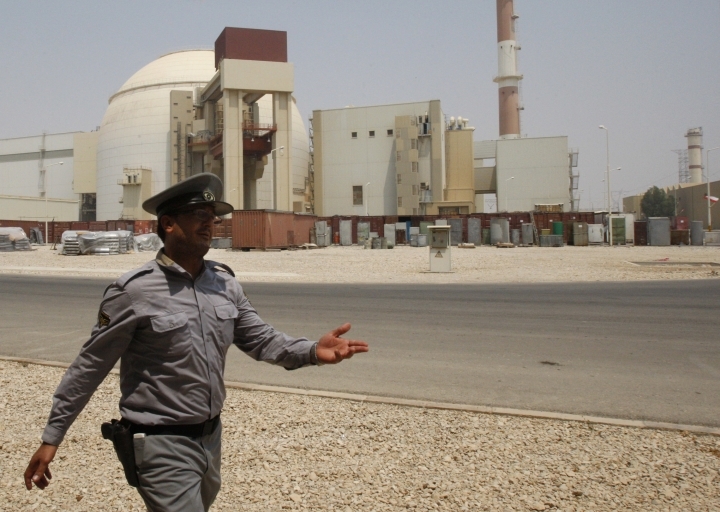 Iran also reconfigured a heavy-water reactor so it couldn't produce plutonium and agreed to convert its Fordo enrichment site — dug deep into a mountainside — into a research center. It granted more access to International Atomic Energy Agency inspectors and set up a system that allows the U.N. watchdog to inspect other sites. In exchange, world powers lifted the crippling economic sanctions that had locked Iran out of international banking and the global oil trade. It allowed Iran to make purchases of commercial aircraft and reach other business deals. It also unfroze billions of dollars Iran had overseas. The deal, however, does not directly stop Iran from testing or firing ballistic missiles. It also has a series of rolling expiration dates. In 8 ½ years, for example, Iran can start testing up to 30 more advanced centrifuges, a number it can greatly expand two years later. Fifteen years after the deal, restrictions on Iran's uranium enrichment and stockpile size end. During the life of the accord, Iran is limited to a level where it cannot produce a bomb and — if the deal were to fall apart today — experts say it would need at least a year to build one. 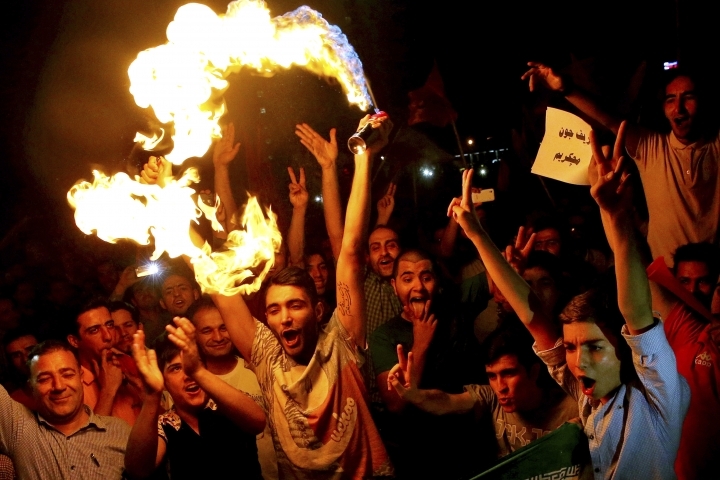 If Iran violates the deal, sanctions can immediately be re-imposed. The deal's opponents argue it allows Iran to build a bomb after it expires, something Iran has explicitly promised in the accord not to do. After the 15 years are up, Iran could have an array of advanced centrifuges ready to work, the limits on its stockpile would be gone, and in theory it could then throw itself wholeheartedly into producing highly enriched uranium. But at the same time, nothing in the deal prevents the West from trying to rein Iran in again with sanctions. The deal's architects and supporters say the idea is to increase dialogue and trust during the intervening 15 years and negotiate an extension or a new accord. 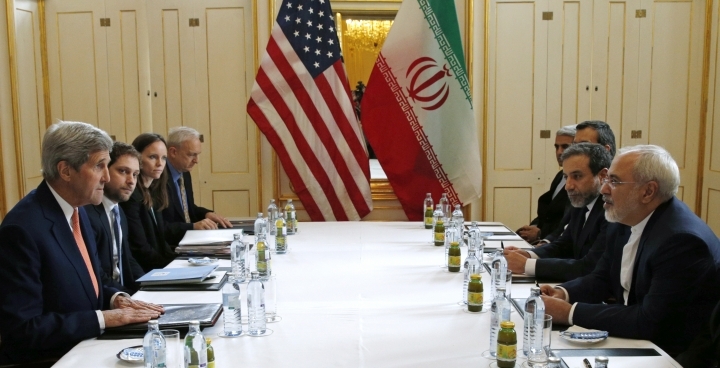 Later deals, they argue, also can tackle other outstanding issues between Iran and the West. The nuclear agreement marked President Barack Obama's biggest foreign accomplishment. Trump, who has called the deal "a disaster" and "the worst deal ever," has worked on unwinding much of Obama's domestic and foreign agenda. Trump criticizes the deal for not including Iran's ballistic missile program or Tehran's support of groups like Hezbollah in Lebanon and its aid of embattled Syrian President Bashar Assad. He also has criticized the fact the deal's terms expire. He said the accord "threw Iran's dictatorship a political and economic lifeline." Israeli Prime Minister Benjamin Netanyahu, long a hawk on Iran, similarly has criticized the deal. 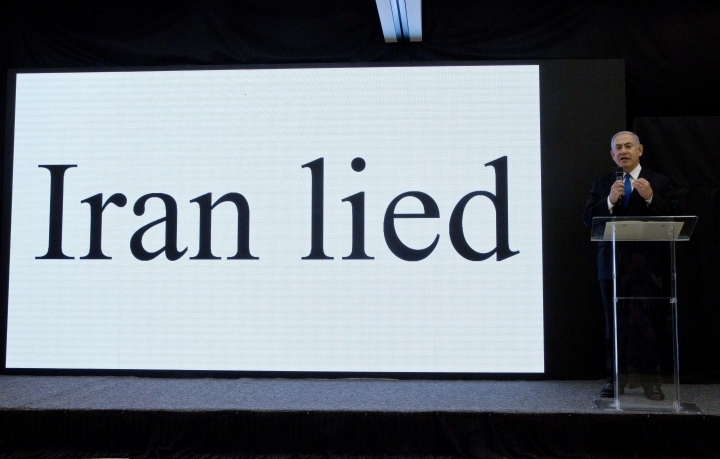 Seeking to ensure Trump's withdrawal, he held a news conference last week alleging "Iran lied" about its nuclear weapon ambitions in the 2000s. But the information he shared seemed to match up with what the IAEA already reported about Tehran's program. Israel itself is widely believed to have its own never-disclosed nuclear arsenal. In Iran, meanwhile, many say they haven't seen the economic benefits that President Hassan Rouhani said would flow in from the accord. The public has been hit by spiraling inflation, fueling nationwide protests in December and January. Iran's nuclear program actually began with the help of the United States. Under its "Atoms for Peace" program, America supplied a test reactor that came online in Tehran in 1967 under the rule of Shah Mohammad Reza Pahlavi. That help ended once Iran's 1979 Islamic Revolution overthrew the shah. In the 1990s, Iran expanded its program, including buying equipment from A.Q. Khan, the father of the nuclear program in Pakistan, which has produced an arsenal. Among its activities, Iran "may have received design information" for a bomb and researched explosive detonators, according to the IAEA. By August 2002, Western intelligence services and an Iranian opposition group revealed a covert nuclear site at the central city of Natanz. Iran to this day denies its nuclear program had a military dimension. In the early 2000s, Britain, France and Germany launched nuclear negotiations with Iran that the U.S. sat out. By October 2003, Iran suspended enrichment. But it resumed it again in 2006 under hard-line President Mahmoud Ahmadinejad. World powers imposed crippling U.N. sanctions locking Tehran out of the global economy. The U.S. under the Obama administration started secret talks with Iran in Oman after President Hassan Rouhani, a relative moderate, took office. Iran and world powers ultimately reached the Joint Comprehensive Plan of Action, or the nuclear deal, in 2015. Expect European nations to try to hold the accord together. Iran will likely keep up its criticism of the U.S., but probably won't back out of the deal, given its business interests. However, the U.S. pullout will weaken Rouhani's hand in Iranian politics and potentially strengthen hard-liners. AP coverage on the Iran nuclear deal: https://apnews.com/tag/Irannuclear .